Denial is serious. It’s a refusal to acknowledge truth or reality. It can have benefits, but denial can also be our undoing and have life-threatening consequences. It affects not only individuals. Denial in the form of "group-think" can dangerously take over families and entire groups. Organizations, sub-cultures, religious sects, and political zealots can deny abuse, addiction, racism, genocide, corruption, and criminality. We can deny positive input as well as negative. Denial can restrict expression of our rights, our power, and our abilities, diminishing our self-esteem and capacity to pursue our goals. Denial is the first and simplest psychological defense mechanism. Typically, children deny wrongdoing to avoid reprimand. I recall my 4-year old shaking his head, while denying from chocolate-smeared mouth that he’d eaten ice cream in the wee morning hours. Adults deny wrongdoing, too, notably politicians, criminals, abusers, addicts, and adulterers. Conscious lies are usually motivated by self-preservation and fear of punishment. While not admirable, they’re understandable, though less sympathetic when motivated by a quest for power. What’s more troublesome is our denial in believing them. Usually, denial is unconscious. We all do it. It can be tricky to uncover something that is unconscious. (See “Are You in Denial?”) We not only deceive ourselves, we forget, excuse, rationalize, and minimize. We might be aware of the facts, but deny or minimize the consequences, or even acknowledge them, but stubbornly refuse to change or get help. Our brain is wired for survival, and denial serves that function. There are many reasons for denial, including avoidance of physical or emotional pain. 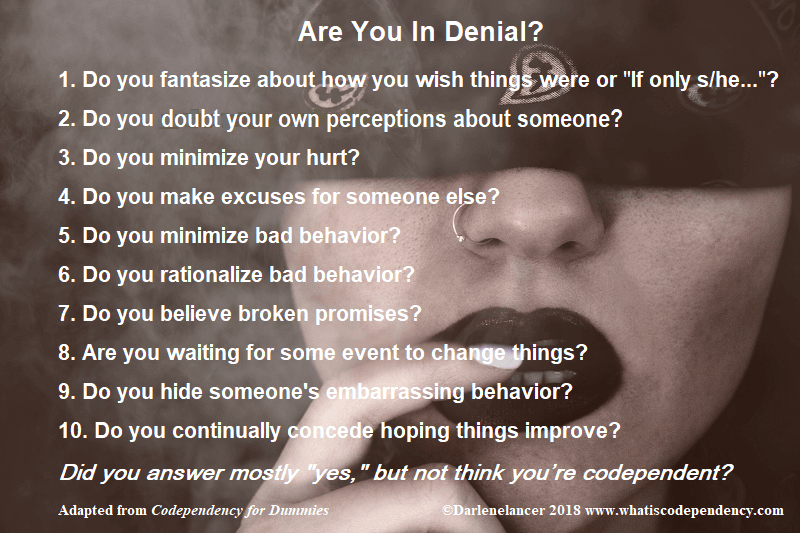 Denial is adaptive when it helps us cope with difficult emotions, as in the initial stages of grief following the loss of a loved one, particularly if the separation or death is sudden. Denial allows our body-mind to adjust to the shock more gradually. Denial also builds cohesion, especially between loved ones. It’s a unifying force between spouses, and among families, groups, or political parties. We overlook things that might that might cause arguments, hurt, or separation. One study showed that people will forgive a member of a clique four to five times more than a stranger. Idealization supports denial and blinds us to anything that would mar respect for a partner, family or group member, or leader. We deny reality to maintain the status quo due to fear of change and the unknown. For this reason, people believe the demonization of immigrants, or other races, or religions. If we favor a politician or love a cheating or abusive partner, we may ignore truths that would create disillusionment and/or require us to struggle with uncomfortable feelings and what to do. A deceived spouse might prefer to believe lies rather than confront an intolerable situation that is not only painful, but that could lead to unwanted consequences, like divorce. (See “Secrets and Lies: The Damage of Deception”). We defend untruths and blatant lies of people we want to believe. We're distrustful of information that’s contrary to our beliefs (including unconscious ones), and will even double down to reduce inner conflict or “cognitive dissonance.” This process is termed motivated reasoning that helps regulate emotion. Consciously and unconsciously, we select information that affirms our beliefs and disregard facts that don’t. When we have internalized shame, we will do the same with positive feedback that is incongruent with internal negative beliefs about ourselves. Low self-esteem makes it difficult to receive a compliment, praise, and love. If we believe that we don’t deserve it, our minds can actually twist a compliment into criticism, and we can’t be convinced otherwise! Shame breeds denial in both victims and liars. It’s a major cause of unreported abuse – why victims don’t disclose, minimize, and deny it and why addicts don’t seek help We might ignore our mounting debt to avoid the same of admitting it and having to lower our spending or standard of living. A parent might look the other way to avoid accepting responsibility when his child is bullying peers or getting high. Facing the truth can expose us to pain, possible loss, and shame about our own behavior or shortcomings. Parents also deny children’s needs and feelings, telling them they don’t or shouldn’t feel a certain way or need or want something. Children idealize their parents and must adapt to survive. They blame themselves and learn to doubt or deny perceptions, feelings, wants, and needs. This can lead to toxic shame that unconsciously colors their entire adult lives. Some people repress or deny their past and insist they had a happy childhood to avoid painful truths. We also deny problems that grew up around. We won’t realize that something is wrong. If we were emotionally abused as a child, we might not recognize abuse or object to mistreatment. We’d likely take the blame, or minimize, excuse, or rationalize it, e.g. “It’s my fault,” “It’s enough that she loves me,” “My husband doesn’t mean it,” or “My wife just has a temper.” If we were molested, we might not notice or protect our child who’s being incested. If we grew up with alcoholism, we might normalize our spouse’s or our own alcohol addiction. Denial affects future generations and can cause families and entire groups to endure decades of shame that’s hard to reverse. When we face the truth, we can seek help and interrupt that legacy. When we deny negative feelings and memories, it deadens our senses. All our feelings get suppressed, including joy and love. We become increasingly numb as our heart closes. Similarly, when we deny our wants and needs, our enjoyment of life diminishes. We sacrifice our desires and live in quiet desperation. Denial of our value prevents us from receiving love and achieving our goals or gaining any satisfaction from our successes. Moreover, when we repeatedly tune out reality, problems grow. Sweeping something important under the rug makes it harder to correct later. Many people afraid of cancer delay getting biopsies, even though early intervention leads to better outcomes. The same is true for treating mental health and marital problems. Our psyche knows the truth, and our discomfort might manifest as passive-aggressive or addictive behavior, displaced anger (yelling at our children instead of our spouse), or as a physical or mental health problem. Research shows that denial of stress and negative emotions have serious health risks that can lead to heart attacks, surgery, and death. When a society denies racism, corruption, immorality, or abuse of power, institutions are at risk. Like individuals, societies sicken. People become numb, develop a sense of futility, and a downward spiral ensues that allows the worst in human nature. Become more mindful through meditating and journaling. When you have a knee-jerk reaction to opposing views, take a breath. Get all the facts. You don’t have to agree, but listen to alternative opinions and interpretations of facts. Are you having wishful thinking about a problem when the facts prove otherwise? Don’t bury problems, and assume no one notices. Instead, be willing to initiate difficult conversations about uncomfortable subjects. Don’t procrastinate. Talk to a professional about your concerns.